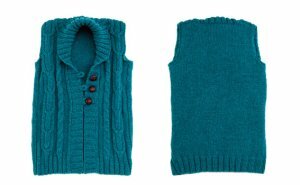 Taken from Knit Simple - 2011 Fall: "An elegant hip length vest carries a double-cable pattern on a reverse stockinette background along its front pieces, closed by I-cord button loops." This pattern is in Knit Simple - 2011 Fall, page 74. Size US 10 straights, US 10.5 straights, US 10-32" circulars, US 10 DPNs for I-cord, cable needle, and three 1 1/8" buttons are required but not included. Finished Bust Measurements (buttoned): 34 (37, 40.75, 43.75, 48, 52)". Gauge: 15 sts over 4". Color Shown is #1960 Teal. $65.00 -- Kit price including yarn only (no book or pattern). $78.00 -- Kit price including yarn only (no book or pattern). $91.00 -- Kit price including yarn only (no book or pattern).